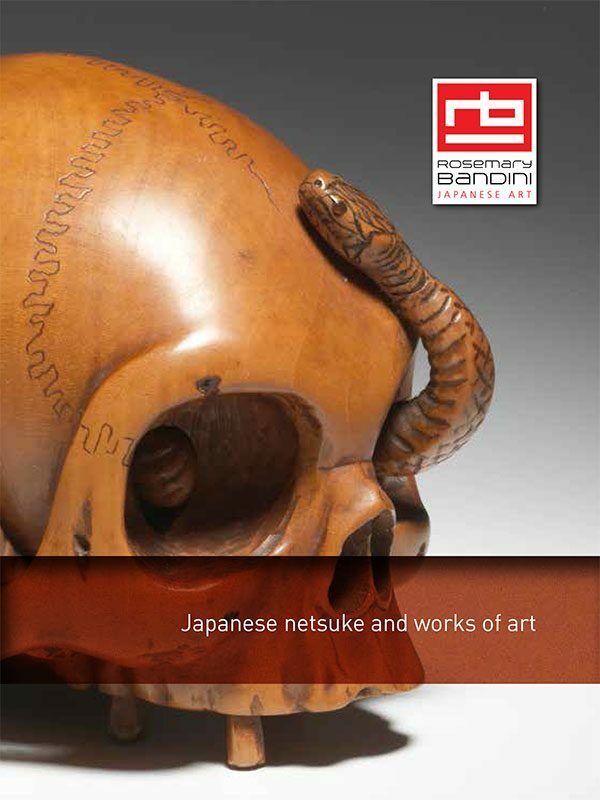 The latest Japanese netsuke, inro and sagemono catalogues, also featuring a selection of Japanese netsuke, inro, sagemono and kiseruzutsu for sale, published books and catalogues for sale, updates on upcoming netsuke exhibitions, news and calendar events in the netsuke world in general. 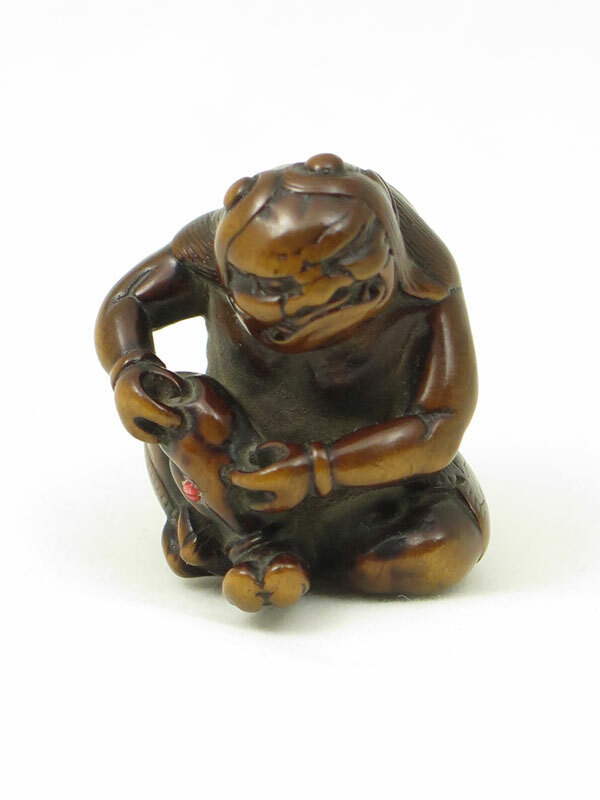 In my experience as a netsuke dealer the biggest thrill is not the sale of a piece, but rather the discovery of a piece – that magical moment, that collectors will also know well, when your hand closes on a netsuke that you know is going to be special. When my eye first made contact with this piece my first thoughts turned to the work of the Meiji master, Rokko. However, once in hand I realized it was crisper and more tightly detailed – and that the signature under the foot read Mondo. 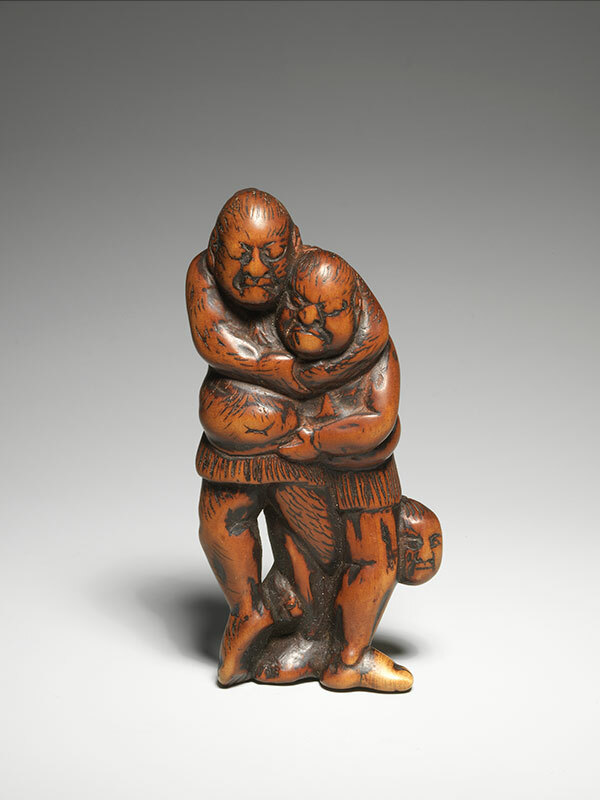 However this carver’s name is associated with polychrome netsuke in the Shuzan-style carved at the turn of the 20th century, whose vividly coloured detailing immediately announces their pedigree. A puzzle indeed. Further investigation revealed that Mondo was the art name used by a very long line of sculptors of Buddhist statuary. 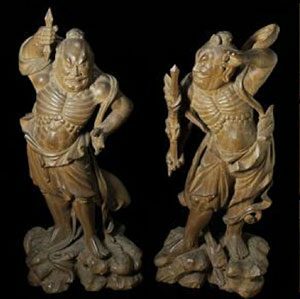 The Museum of Fine Art in St. Petersburg, FLA, has a sculpture of a Buddhist priest dating to 1754 and made by Mondo Fukuoko of Kyoto. 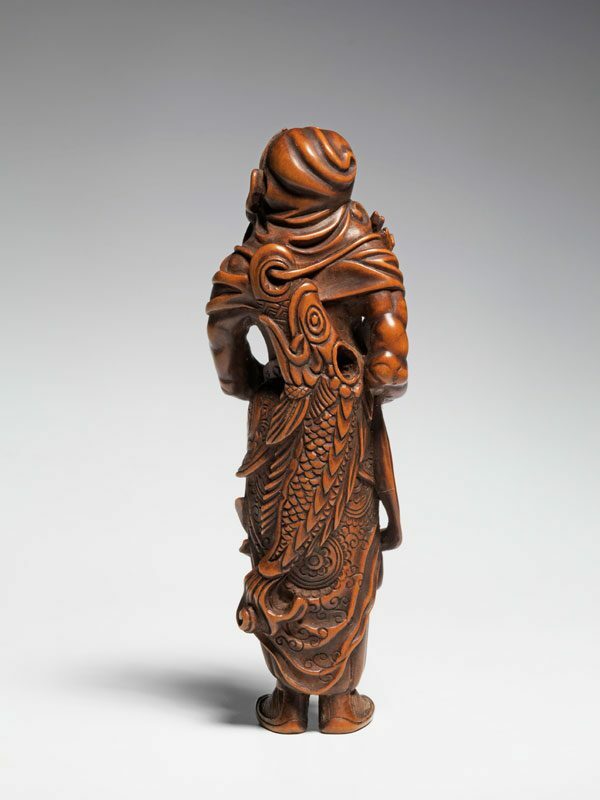 Reikichi records that the 32nd sculptor of this lineage carved Shuzan-style netsuke for the export market. His dates were 1857-1917 and his work was fairly prolific. 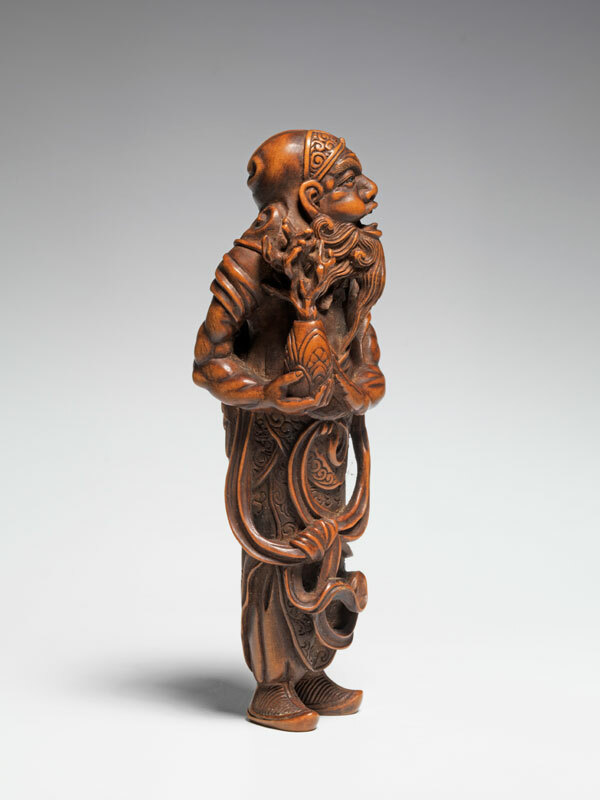 Various examples of wood okimono by him are recorded, not all being coloured with pigment. 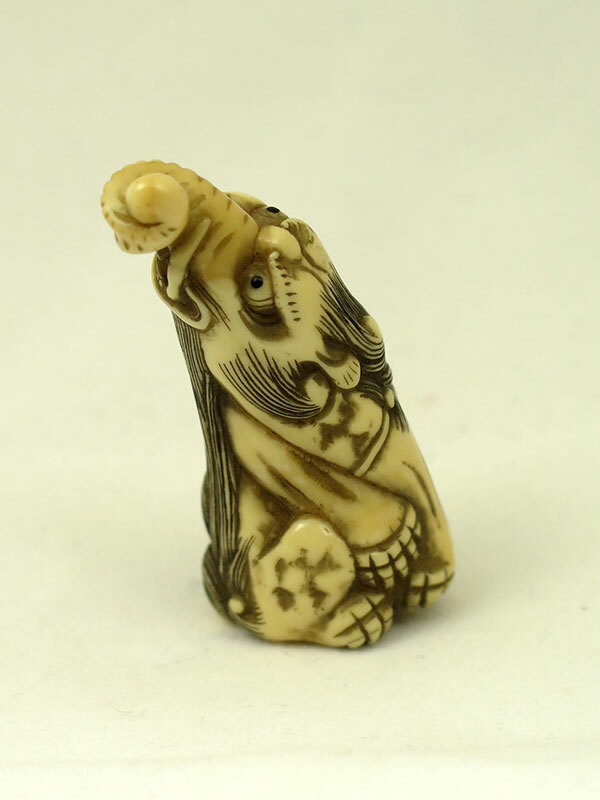 However, the skill and style did not seem to fit this netsuke. 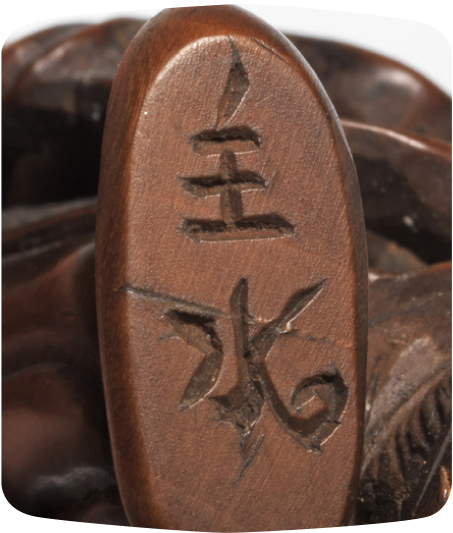 The 33rd Mondo worked alongside him, taking the name of Tekisui up until 1917. 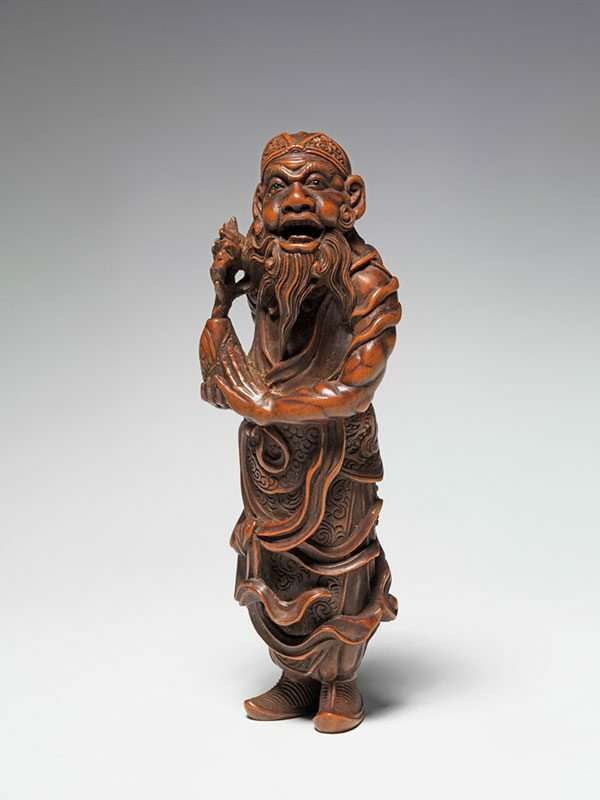 A graduate of the Kyoto Arts and Crafts School, Reikichi records him as living by the Sumiyoshi shrine in 1943, by which time he was an old man (a mokugyo-shaped kogo by him records that he carved it at he age of 87). Mondo 32 died in March of 1917 and we know that Tekisui signed works as Mondo in that same year. 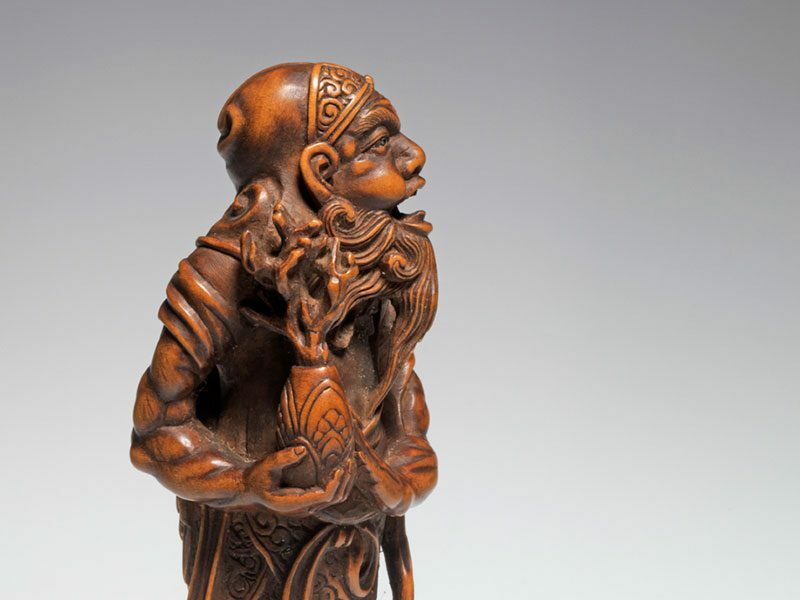 Like his forbear, he also produced the simply carved and coloured pieces associated with the name. His signature differs from that of Mondo 32 in that the third stroke of the second character is very cursive, ending with a ‘curl’. 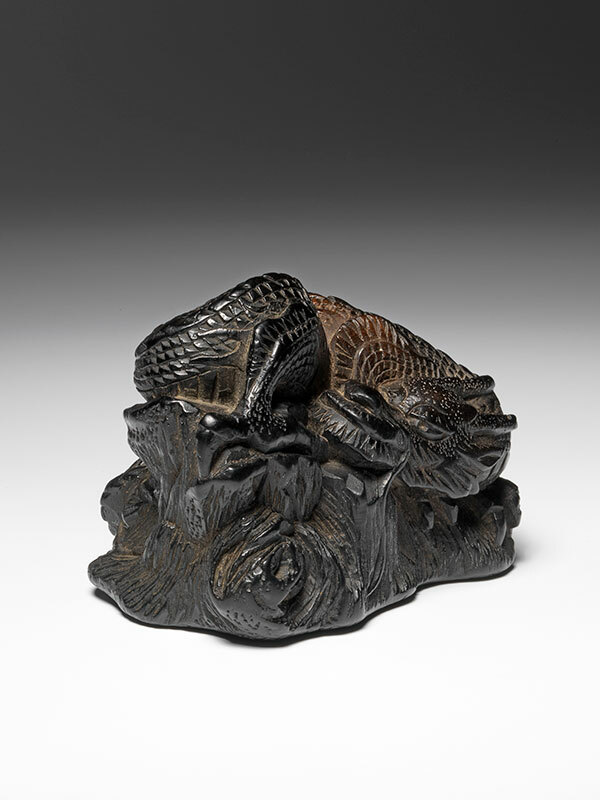 Given that fine carving does not seem to have been his ‘bread and butter’, it is clear that he was nonetheless also a very talented sculptor, which suggests that this netsuke of Ryujin was made as a special commission. Okimono-sized statues of a pair of Nio by also reflect great expression and movement. 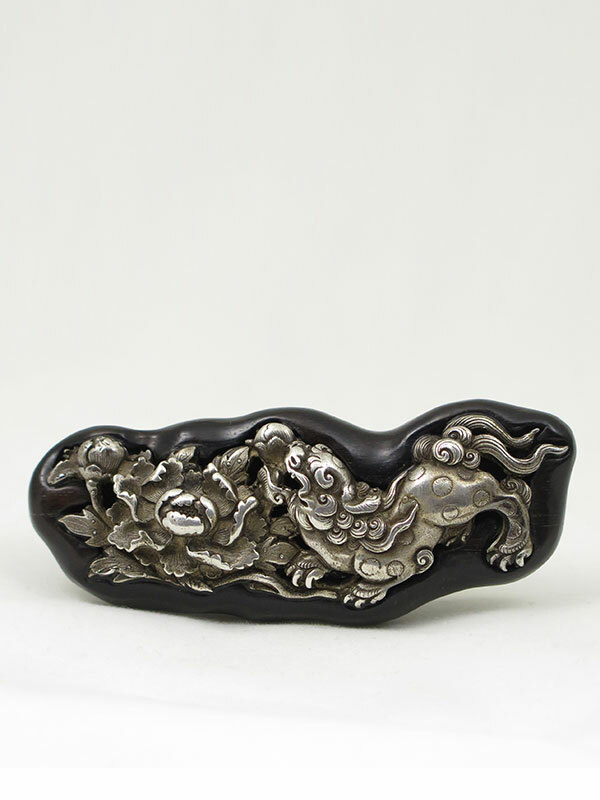 Keep up to date with the latest news, events and netsuke on offer. 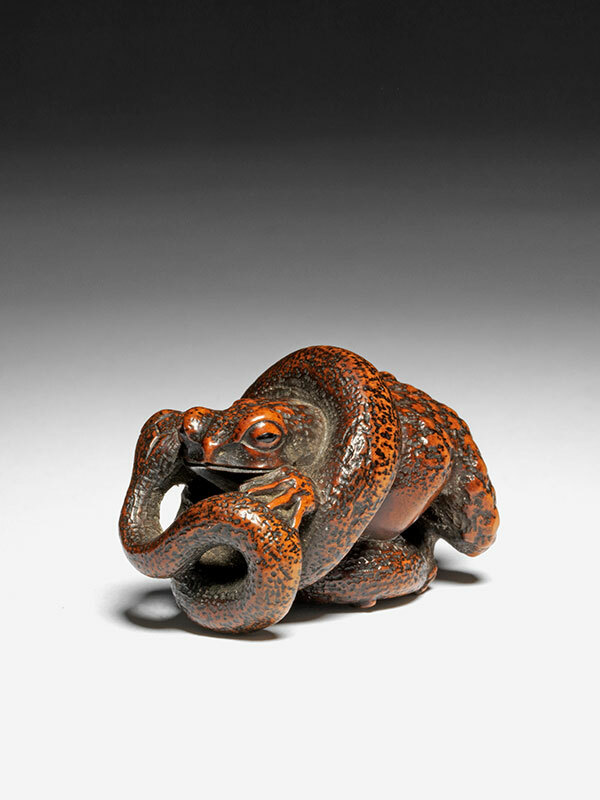 Specialising in antique Japanese netsuke and inro, Rosemary Bandini started her career in the Japanese department of Sotheby’s in 1977, before marrying Luigi Bandini of Eskenazi Ltd. With him, Rosemary worked on the preparation of exhibition catalogues until 1996, subsequently organizing two further exhibitions for Eskenazi. Read more.